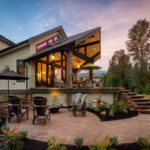 A stunning custom built home in Harrison BC. Every detail was considered and carefully integrated – from the master bedroom’s boxed bay window, copper-topped exhaust fan in the inspiring kitchen, hand-painted powder-room walls, and an open games-room over the garage. The low maintenance durable siding, stonework and roofing were important aspects for the retiring couples lifestyle. The expansive great room with soaring vaulted ceilings and beautifully designed outdoor living spaces lends well to this couples desire to entertain. To see other custom homes we have built, see the Custom Home gallery. Or contact us for your free consultation.